Open up Eclipse and select Project (from the top menubar) then Properties. 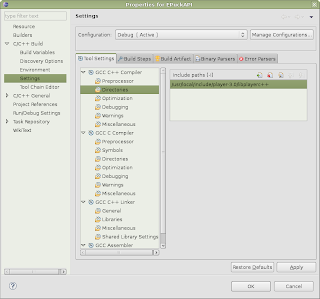 Select the C/C++ Build >> settings from the left sidebar. Tool Settings should be the default tab that is open. If you want to develop in C rather than C++ then paste `pkg-config --libs playerc` into the box instead. It will probably work now if you have the PATH set on your computer properly. It didn't work for me so I told Eclipse where to look for all the Player libraries. Under the GCC C++ Compiler select the directories tab and paste the location of the folder containing the player headers. On my computer this was /usr/local/include/player-3.0/libplayerc++ it will probably be different on different computers. Do the same for the directories tab in the GCC C Compiler section. Congratulations. You can now start working on some Player/Stage code in Eclipse! If you need to test your code it is still necessary to start a Stage simulation by opening a terminal and running $ player yourcfg.cfg. 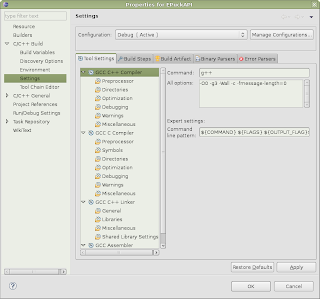 Then when you hit run in eclipse it'll compile and then start running your code on that simulation. Hi Hussain, I use the CDT version of eclipse that's optimised for C/C++ development. Since all the coding I ever do is in Player/Stage it's better for my work that the normal java eclipse. 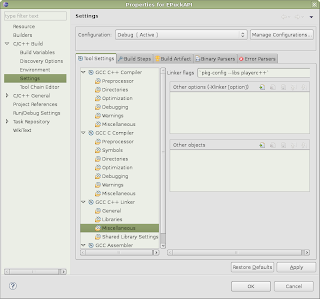 Or go to the eclipse downloads page here: http://www.eclipse.org/downloads/ and install the C/C++ IDE. I could set up my IDE for player/stage. hi, have u worked on map building or localization of robot .. i need help in implementing the same .. or how to implement the existing vfh , amcl and wavefront drivers. Thank you from Berlin Germany. Thanks for your post, it was helpfull to try it but it does not work for me. I have eclipse cdt, ubuntu 12.04,player 3.0.2. Player works fine when I call it from a terminal. I got an error "undefined reference" when I tried to build the project. Anyone has idea? can anyone help me regarding it? I have got Undefined Reference to Player client. "Undefined Reference" means you're not linking against the libplayerc++ library. 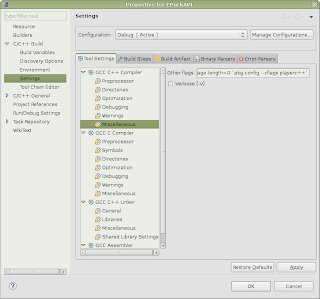 In the Eclipse project settings, go to C++ Build -> settings, then find the "libraries" button under the Linker options. Add "playerc++" to the Libraries, and (probably) "/usr/local/lib" to the library search paths if that's where you installed Player.